Going Pro: Should You? Or Shouldn’t You? The new MacBook Pro is a marvel of engineering. But there are a whole lot of engineering marvels that you don’t need in your life. The question for the day, is the MacBook Pro one of them? I am on record as not being on board with designating machines as “Pro” Machines are not professional. People are. There is not particular specifications that make a machine perfect for all professionals. One hardly gets to be more professional than a CEO. But ironically, the higher up you are in a company, the smaller your technical demands. Tim Cook runs Apple from an iPad, and maybe not even an iPad Pro. I don’t know that I would call any iOS device a piece of pro equipment. Professionals can use all kinds of equipment to do their work. So the best thing you can do is throw out the “Pro” moniker and focus on your tasks rather than your title. It is possible for one to identify too closely with the products they use. Surely if you think of yourself as a pro, you need a product made for pros. If you can make due with the non-pro product, then perhaps you are not a real pro. If some of the MacBooks are pro, what are the others? MacBook Schlubs? Only schlubs buy a MacBook Schlub. You just as well buy a Windows laptop. The idea is that if you want to be considered a pro, you have to act like a pro, dress like a pro, and carry gear that makes people think you are a pro. But that’s the kind of nonsensical, anachronistic thinking that should be left in the cultural junk drawer next to the bell bottoms. Forget about product names, ego, and what you think other people will think of you. It is time for a more honest assessment of what is right for you. This question is not about your profession. You don’t even need to have a profession, or a job for that matter. The question is not about your title or occupation. It is about what you do. Do you like to use applications that use a lot of CPU and other computing resources? If that is what pays your rent, or even if it just gives you joy, then you need a computer with a lot of computing resources. Perhaps you like to use applications like Logic to produce music. You might be surprise at just how few computing resources it takes to do that. You do not automatically need the most powerful machine just because you are a creative pro. Logic is coded very well so that you can use it with lots of plugins running at once on a midrange or lower machine. On the other hand, just surfing the web with Chrome could bring down a Mac Pro because it is coded so poorly. That is why the focus should always be on what it is you actually do with a computer. There are people who don’t even have jobs who should be using a MacBook Pro. And there are leaders of industry who don’t need anything more than an iPad. No one can tell you which notebook is best for you until they know exactly what it is you do. What you need depends on how computationally challenging your tasks are. Once you assess what it is you do from day to day, you will be a lot closer to making a good purchasing decision. This is a tricky one because there is no end to the number of unreasonable answers you can convincingly give yourself. There is something to be said for being aspirational. But aspiration must make contact with reality at some point. You really are not a few years from become a photo or video editor. Maybe you will enhance a few images and produce a few home videos. But guess what? You can do that on the lowest level Mac Apple sells. You do not need Photoshop or Premier to do any of that. Even if you wanted to play around with those apps, you still don’t need the highest speced Mac to do it. You don’t know what the future will bring. So you can’t proof against it. There are a number of people who bought a Maxed out Mac Pro for multiple thousands of dollars. They were unhappy before the first year was up. They spent a lot of money on future-proofing to no avail. Another truth seldom spoken is that you can’t future proof in a way that makes any financial sense. If you purchase a notebook with maxed out hard drive, RAM and CPU, you are spending more than double for a decent machine. Financially, you are better off getting the base model and upgrading it in a year or two. The best way to be ready for the future is to buy the laptop from the future. Today’s tech will never be equivalent to tomorrows tech. You will look at your $4,000 notebook in a year and be sad that you don’t have the latest tech. Had you only spent $1,700, you could have sold it in a year, bought a new one, and been way ahead of the game. The year before Continuity was announced, no one saw it coming. After it was announced, everyone wanted it. Without the modern tech, new features simply will not work. It doesn’t matter how much fast ram you loaded it up with two years earlier. It is better to have tech that is ready for today’s challenges rather than tech ready for tomorrows challenges that are not yet here, and are unlikely to work out the way you think they will. The one exception to this rule might be if you know that you are not going to purchase another Mac for the next five years. You are never going to want to upgrade any components, and will not be tempted by new models with new capabilities. This is going to be it for the next five years. You may have a case for purchasing a little more than what you need. Even so, it will not be a particularly good case. Your machine will not get slower over time. That is another myth. Your machine will only get slower if you load more stuff on it than it was intended to handle. It might get slower if you update the OS which happens to require more resources. The same is true if you update apps you use on a regular basis. But if you know you are going to be keeping this machine for the next five years, you really shouldn’t ever update the OS except for security updates. When Apple stops updating your current OS, you should move to the next one, or just buy a new computer. That is going to happen in three or four years. The same is true for your critical software. You should not update it except for security updates. These machines cannot receive hardware updates. You can’t just pop in a new graphics module. You can’t even upgrade the RAM. So you should also not upgrade the software if longevity is your goal. That means you really don’t need to spec it out to make it last for five years. You just need to stay the course with what you have. If your hard drive breaks down and has to be factory replaced, you might can pay a bit extra to have it swapped out for a bigger one at that time. But it hardly makes sense to max out the specs at the time of purchase. You might be thinking that with more ram, you will be able to upgrade the OS two or three times and be safe if the system requirements go up. But it doesn’t really work that way. Right now, Mac OS runs beautifully on 8GB of RAM. That will likely be true for as long as your machine is supported by Apple. There will not be a sudden big jump to 16 as minimum. Those jumps take a long time. You are not going to suddenly need a TB drive for the OS when 128 is sufficient presently. You might want extra drive space if you like to keep pictures and music locally. But the OS is not going to get up and leave you behind during your supported time. But what about after the supported three years of your hardware? Here’s the thing: all the RAM in the world will not make your computer safe when it no longer receives security updates. You simply should never upgrade past that point. The biggest hard drive you can buy will eventually fill up. You should probably bee keeping those big files on an external drive anyway. No matter how you slice it, you can never future-proof. I personally would not plan to keep a machine for more than two years. At that time, it still has pretty good resale value. That makes the next one that much easier to buy. You will always have a machine that can run the next set of features. You will never run out of security updates. Two years works for me. However, you could go for as much as four years if you just don’t like change. There are plenty of people who never upgrade their software, and continue to use their devices for 6 or 7 years. Desktops tend to last longer than laptops. But it is not about how long you can keep it operational. It is about how long you can keep it safely up to date. Trying to proof against the future by purchasing too much machine today is a financially bad decision that almost never works out in your favor. What can’t you do with the low-end? Too many writers and reviewers focus on the limits of the high-end models. For the majority of people, that is probably looking at it from the wrong direction. I can’t even artificially push the limits of the high-end Macs. The real question is what are the limitations of the low-end. From there, we can work our way up to the model we actually need. One of the reasons people buy too much computer is fear. They are afraid that there might be something they want to do that cannot be accomplished on the low-end. So they buy something more expensive without knowing what the true limits are. All modern Macs can keep up with your typing. All modern Macs can switch between several open windows and screens without a problem. All modern Macs can perform just fine when your browser has a lot of open tabs. All modern Macs can handle casual gaming. With the exception of the Air, all modern Macs have Retina displays. That said, there are a few things of which you should be aware: If you use Chrome instead of Safari, the performance of your Mac is going to suffer. That is true even if you have a Mac Pro. Chrome is one of the worst software citizens of any platform. It will make your fast system seem slow. You will be cursing the system when you should be cursing Google. Flash is another thing that will slow down your speed demon. The average person simply has no idea what flash even is. And I am not going to try to explain it here. Just know that it is a part of every poorly coded website that seeks to do something bad to you. It is the tool of choice for bad actors. Think Facebook and Facebook games. To the extent that your Mac can get a virus, flash is almost always the culprit. If your fans are running for no good reason, there is probably a runaway flash process at the heart of it. Getting a higher-end system will do little to change any of this. If you are very sensitive, you may notice a slight stutter when moving between a lot of windows and screens on a low-end Mac. At 8GB, it is likely not the RAM. It is probably the graphics unit. If your system has a spinning drive, that is even more likely the culprit. You shouldn’t notice any stuttering or beach balling on a machine with 8GB of RAM and an SSD. Having done so many times, I can attest to the fact that you can run audio apps like Logic on a low-end machine. I am not a photography buff. So I don’t know about high-end photography apps. I know that there are some tasks like rendering a movie that can take longer on a low-end machine. But unless that is what you do for a living, you probably won’t miss the extra 40 seconds. If you earn your living doing work where the 40 seconds makes a difference, you should probably get the most powerful machine you can afford. A developer friend of mine described it this way: Compiling once simply doesn’t matter. You won’t miss the 40 seconds. But developers have to compile many times per project to see how the changes affected the program. An extra 40 seconds per compile is a lot of wasted time. This same principle applies to photo editing, music and video production, and anything else where a resource-intensive process needs to be repeated many times during a project. But the people in this category are not choosing a computer. They are starting with the most expensive option, then maxing it out. They are not making the same kinds of choices that you are. I’m not saying that you shouldn’t get a MacBook Pro. I am only saying that you shouldn’t do it for bad reasons. With Mac notebooks, you can start climbing the price ladder real fast. The MacBook Air does not have a Retina display. But it is also one of the best selling notebooks of all time. It couldn’t be that bad. 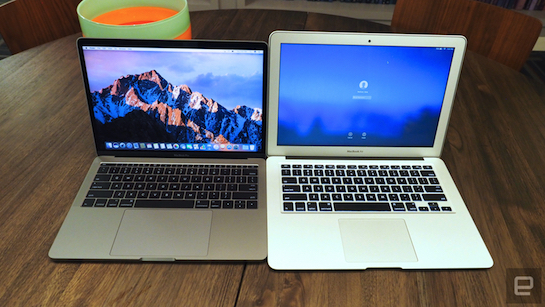 Still, if you must have a Retina display, the 12” MacBook is one of the most compact packages you can buy. But it is not very powerful. The RMBP from 2015 can be had for about the price of an Air if you get a refurb model, or the price of a 12” if you get it new. It checked all the boxes for a lot of professionals last year. It continues to do so this year. There are other little reasons to consider. They are slightly faster than last year’s RMBPs. But not faster enough to make the jump in my opinion. They also come in space gray. I suppose that could be a reason if you are just tired of silver. They have a metal hinge, a stainless steel logo, and no startup chime. Those could be considered advantages. But any of the four bulleted reasons could stand alone as reason enough to move to one of the new models. The 15” model is more of the same. You would probably choose that one if you were planning to use it as a desktop attached to an external monitor that costs as much as a computer. If none of these reasons are compelling to you, there is probably no reason to go pro. I ended up with the base model 13” with Touch Bar. It is not because I need the power or the Touch Bar. My reasons were as follows. These are not really good reasons. Just for contrast, last year, I did all my work from an iPad Pro. It was fine. But at the end of the day, I don’t have to give an account to anyone for my purchases except my wife. And she approved, grudgingly. Because you want it is reason enough to buy anything you can afford. Just don’t fool yourself into believing that you need one of these because they are marketed as professional machines for professional users. That simply should not factor into your decision making process.